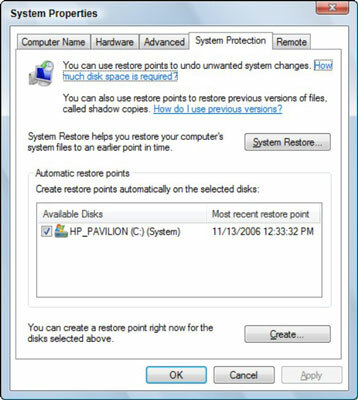 Every once in a while, it’s good computer practice to create a system restore point in Windows Vista, particularly when you install some software or tweak some settings in Windows and things seem to be running just fine. Creating a system restore point is just like backing up your files, except that you’re backing up your settings. Once a month or once every couple months works for most people, but if you frequently make changes, create a system restore point more often. 1Choose Start→Control Panel→Backup Your Computer (under System and Maintenance). The Backup and Restore Center window opens. 2Under Tasks, click Create a Restore Point or Change Settings. The User Account Control might display a dialog box asking for your permission to continue; if so, click Continue. 3On the System Protection tab of the System Properties dialog box, and click Create. This will create a restore point on the System drive, usually C. The System drive is selected by default, but if you have more than one drive, you can create a restore point for any of them. If you select an additional drive, you’ll notice that the Create button dims. 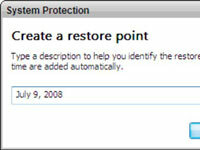 To create the restore point, click Apply. 4Enter a description; this description is helpful if you create multiple restore points and want to identify the correct one. The current date is usually your best bet. 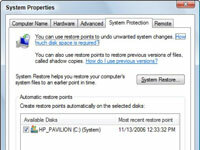 The system restore point is created and is available to you when you run a System Restore. A dialog box appears telling you the restore point was created successfully. 6Click OK and then click OK again to close the Control Panel. Remember: This doesn’t back up your files, only your settings. If you lose some files, a Restore Point won’t help.